For two reasons 2008 is very significant. (i). It is the 60th anniversary of the Universal Declaration of Human Rights. (ii). May 3, saw the first comprehensive human rights treaty of this 21st century - the U.N. Convention on the Rights of Persons with Disabilities (CRPD) come into force. This Convention concerns explicitly the rights of every (‘dis-abled’) human being. It is also a critical entry point for building a society that values difference and respects the equality of all human beings. It is a great pity that our celebrations of the ‘UN-day’ on October 25 passed without any due recognition of these or their national importance! This legally binding international law, accepted by 129 countries, was signed by Sri Lanka on March 30, 2007. India, China, Bangladesh, Thailand and Philippines from our region have also ratified this. CRPD marks the much awaited shift in attitudes and approach to disability ‘from ‘sympathy focused’ social service and social welfare concern to ‘empathy based’ human rights provision. It acknowledges physical and attitudinal barriers and prejudices are major factors of disabling that oppress enabling and empowering. Sri Lanka’s rapidly ageing population is heading towards 18 percent. Many common debilitating conditions are unrecognised. The Parliamentary Committee on increasing road accidents has confirmed that daily, on average, there are 150 ‘reported’ road accidents. The numbers of our heroic service personnel and civilians rendered ‘disabled’ by the cruel war against terrorism are rising. Ability and mobility are passing assets that can be snatched away from anyone irrespective of positions or possessions, rendering us ‘UNABLE’ to differing degrees. We all are ‘able-bodied’ temporarily, and only to varying degree. Life is all about accessibility to the essential and the desired. As such we could all suddenly find ourselves in need of buildings and facilities should be a joy rather than a trial to use. Yet an estimated 18 per cent continue to face ‘man-created’ barriers - physical as well as attitudinal - to their full and active participation in society at day-to-day needs and are often forced to live on the margins of society. Hence ‘disabled people’ are the persons made dis-abled by ‘disabling environments’ built by society. Society therefore has the ability and moral duty to reverse this tragic trend and make environments that will ‘Enable Everyone’. That is not an act of charity, but an Act of Justice. ‘Designing for inclusion’ is a highly responsible professional job involving money, time and effort. As such authorities undertaking constructions may well need expert guidance as to how best to do this correctly, ‘right first time. As life progresses, impairments become inevitable. It means diversity among individuals - including ability to move - is normal in any society. For persons with limitations in ability, as for all persons, the denial of the fundamental right ‘accessibility’ can lead to the simultaneous denial of several other rights and ‘Equality of Opportunity’. CRPD, as an ‘equal opportunity model for everyone’, places great emphasis on accessibility to public buildings and indoor and outdoor facilities. Accessibility is one of its eight key principles. Article 9 is devoted totally to this crucial issue. It is only when this key principle of the Convention is fully realised that our communities will be truly inclusive, meaningfully equal and productively open to everyone. It is the basis for empowering the society towards a formidable and sustainable national economy. December 3rd is the annual observance of the International Day of the dis-abled persons. The International theme for this year is “Dignity and Justice for all of us” - which are two established universal principles. Without “accessibility to public buildings and places”, justice and dignity become a mockery. States are expected to give effect in domestic law to the rights guaranteed by the Convention. Of course legislation alone will not ensure that this Convention will have a real impact on the lives of dis-abled persons. States will need to formulate effective policies and programmes that will transform the provisions of the Convention into practices. Under ‘Fundamental Rights’ Clauses (12.2) and (12.3) of the Constitution of Sri Lanka, ‘Disability that debilitates anyone’ should be included among criteria on which no citizen shall be discriminated against. At a time when we see large and increasing numbers of disabled patriotic service personnel, this inclusion to our Constitution would be a morale boosting timely action by the State. 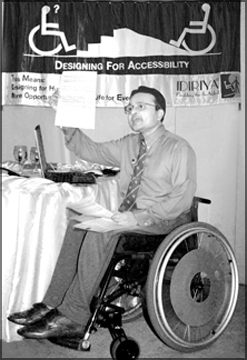 The Writer, Chief Executive / Secretary-General of ‘IDIRIYA’, is a disability activist and a pioneering campaigner on ‘Enabling Environments’.